On the next day after Mass, he returned to the bishop’s house but was told to now provide proof that this was indeed the Virgin Mary and that she really wanted a church built on Tepeyac Hill. The bishop sent two servants to secretly follow him but they said he disappeared into thin air before their eyes. 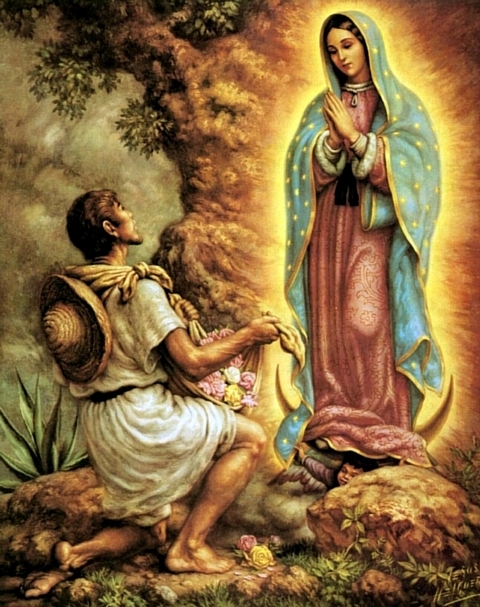 Juan Diego had actually entered the mystical realm of Mary as she appeared to him a third time and agreed to give him that desired “proof” on the next day. She directed him to climb to the top of the barren Tepeyac Hill where he would find roses growing miraculously among the thistles and thornbush in the winter. There was a lush abundance of every color of rose. 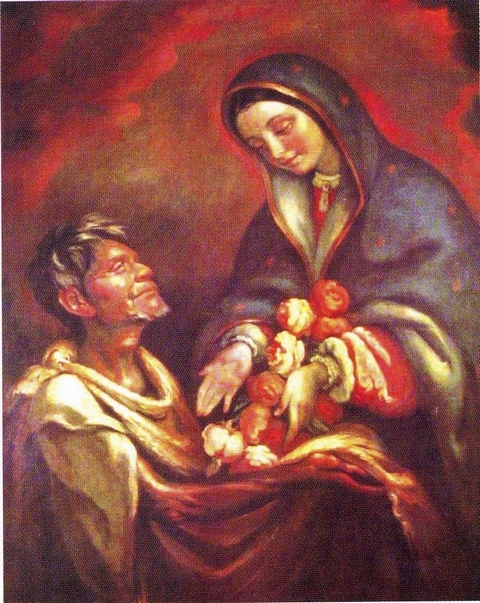 He picked them and carried them to the Blessed Mother, and she arranged them in his cloak, which he then folded shut for his journey to the bishop’s house. This was the fourth and last time he would see her. The bishop was actually eager to see what miracle had been brought to him, but not even Juan Diego was prepared for what was about to happen. As he unfolded his cloak to dump the multi-colored winter roses before the bishop, they were all stunned to see a beautiful image of the Virgin Mary imprinted on the rough cactus fiber of his cloak! The bishop fell to his knees in reverence and from that moment forth, all worshipped and adored this treasure. When Juan Diego returned home, he found his uncle completely healed and telling of a visit that he had had with the Virgin Mary. She told of a temple that would be built on Tepeyac Hill and that her image should be called “Our Lady of Guadalupe” — although the uncle did not know yet what image she was talking about. Ordinarily, the cloth of Juan Diego’s tilma or cloak should have deteriorated in twenty to thirty years. It is made from the maguey cactus plant and is something like burlap, rough and lattice-like. The material is called ayate and is ill-suited for use as a canvas for painting. It is actually made up of two pieces sewn together lengthwise and held together by a single cotton thread. An effort to make a replica of the cloth and image to test its true durability failed miserably — as it deteriorated badly within 15 years. The original cloth and image will be nearly 500 years old soon! And the image is as fresh as ever. 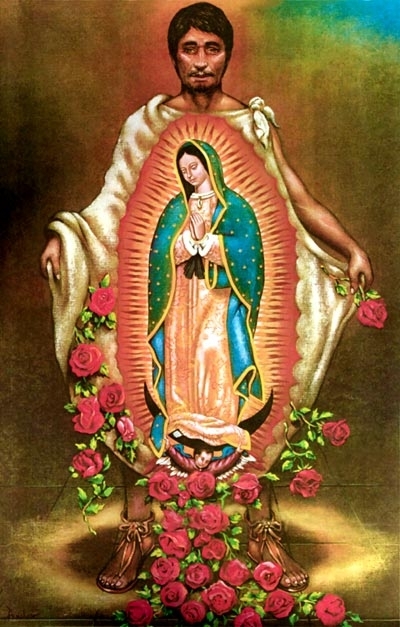 The Indians in Mexico saw something in the image of Our Lady that the Spaniards did not comprehend. In that period, the Indians did their writing in hieroglyphics, so to them the image was a “hieroglyphic letter.” The fact that the natives “read” the picture is most important in understanding the purpose of Our Lady’s apparition. To the Indians, the image depicted a beautiful Lady standing in front of the sun – a sign to them that she was greater than the sun god (Huitzilopochtli), whom they worshipped. The crescent beneath her feet showed that their moon god (Tezcatlipoca) was less than nothing since she was standing on it. The Indians noted that the Lady was not of this world, for a young child with wings was holding her aloft with his two arms. At her throat was a brooch with a small black cross in the center, reminding them that this was the emblem of the Spanish Friars – and there was One greater than she. The “reading” of this sacred image brought whole tribes from all over Mexico, led by their chiefs and rulers, to be received into the Faith. The significance of her words, the meaning of her garments, and her whole appearance on Juan Diego’s tilma were perfectly clear to the Indians. And so it happened that the worship of pagan idols was overcome. Miguel Cabrera, a famous Mexican artist, was commissioned along with six other artists to examine it in 1750. After a very careful examination in great detail, they concluded that it had been created in a “miraculous” fashion – not by any human artist! For the first 116 years, it was unprotected by glass. People freely kissed it, rubbed it, and touched objects to it. In 1753 it was removed from its glass protection for just two hours. But at least 500 people filed by and touched the frail cloth with many objects like sharp-edged crosses, medals, swords, and rosaries – yet no harm came to it. In November of 1921, a bomb was secretly planted in a bouquet of flowers that was placed on the altar – just beneath the divine image hanging above it. The bomb exploded with such force that it blew out windows in the old Basilica, shattered the marble altar, and twisted a large bronze crucifix. Yet, the image of Our Lady and the glass enclosing this sacred treasure were completely unharmed and safe – despite its location right above the bomb. In 1979 — 448 years later — Dr. Philip Callahan, an infrared specialist and biophysicist, scientifically analyzed the Guadalupe image. He found the pigments to be authentic for that period in time but amazingly well preserved, whereas later added embellishments were fading, cracking, and deteriorating while the original image appears to have never aged at all. There were no preliminary sketched lines underneath the painting as could be expected in a hoax. Careful examination with a magnifying glass revealed NO brush marks and no deterioration or cracks in the coloring material. Over the years, many healing miracles have been documented regarding those who came before her image. The image has also been observed to have been weeping tears. Pope John Paul II beatified Juan Diego in 1990 and raised him to sainthood in 2002. The great Basilica of Mexico City was built on Tepeyac Hill and houses the divine image today. 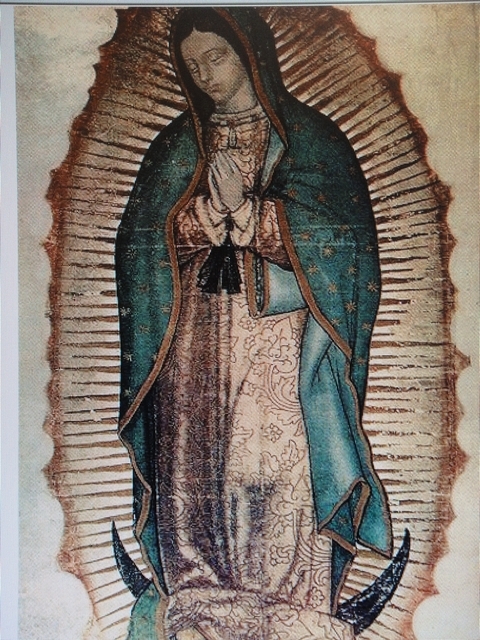 Our Lady of Guadalupe inspired over nine million conversions in Mexico!